Those of you that didn’t think we’d make it ALL THE WAY to day three…here we are! As we quickly approach the start of the next school year, but are still left with enough time to order books through our district before the start of said school year, over the next week or so, I’m going to focus on books that I believe would fit into most schools, either in the classroom or in the school library. The book that I am reviewing today, I stumbled upon on a shelf in a crowded book store while waiting for Davis Sedaris to speak (I know…slight brag). 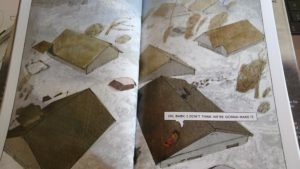 Following this review, will be my review of Josh Neufeld’s A.D.: New Orleans After the Deluge, which was the only graphic novel (or book) that I had ever read about the devastation of Katrina…until now. I saw Don Brown’s Drowned City on a shelf of a local book store in Chicago, and while the small, hard-covered book looked like a young adult title, I was terribly wrong. Not that this book can’t be read by younger kids, for sure it can, but I was not prepared for what was in store when I got it home. 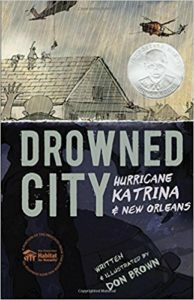 This book quickly and unapologetically tosses the reader into the harsh reality that was Katrina. Large images and jaw-dropping facts, paired with some pages with little to no text, allow the reader to take in the simply crafted images and understand the immensity of the situation. While this book does not focus on particular stories of victims or survivors, it will move you. You may cry, as I did without hesitation (I know…two books in a row that I admitted that I cried. I read some heavy stuff). The events of Katrina are relatively unknown to most of our student population, it having happened almost fifteen years ago, but my students (and hopefully yours) immediately had questions about the situation, many to which I had no answer. Get this book. Pair it with tomorrow’s review: A.D.: New Orleans After the Deluge.